IT consulting companies like Dell, EMC, Microsoft, HP, as well as large global organizations like The Department of Homeland Security, Pfizer, and Aon have used our software for printer migrations. Whether you have 100 printers or 10,000 printers, PrinterInstaller can automate your printer migration. Automate the migration of the backend printers as well as the conversion of the end user's printers. 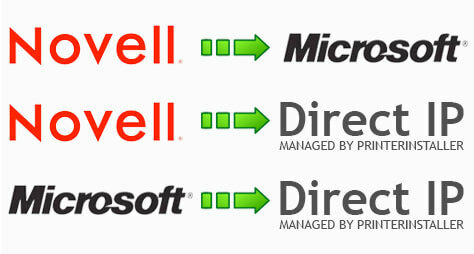 Centrally manage your end user's direct IP printers. The Department of Homeland Security migrated over 400 Novell iprint servers to a single PrinterInstaller installation with 12,000 printers. Now their 45,000+ end users located in over 1,000 locations, use the self-service portal to quickly install direct IP printers.